Paul McGinley’s new book, Salthill - A History, Part 1, begins with a most informative historic timeline, taking the reader from 1557 to 1901. Early documents were sparse but in 1797, a French traveller “wrote of young damsels going to refresh their charms in the sea about two miles from the city”. In 1828, we are told “there will be forty or fifty neat lodges along the sea-shore - where there were but two or three a few years since”, while in 1851 “Dr Gray’s Baths opened at the bottom of what was later to be called King’s Hill”. From then on, Salthill’s destiny as a tourist resort was inevitable. Initially, the home of small tenant farmers and fishermen, Salthill developed slowly, first as a resort where people from Galway city and its environs came to take in the fresh air, or go swimming, and where the local gentry built bathing lodges near the seashore, giving them exclusive access to the sea and its pleasures. In essence the book is the story of Salthill’s development as a major Irish tourist resort in the century following the Great Famine. 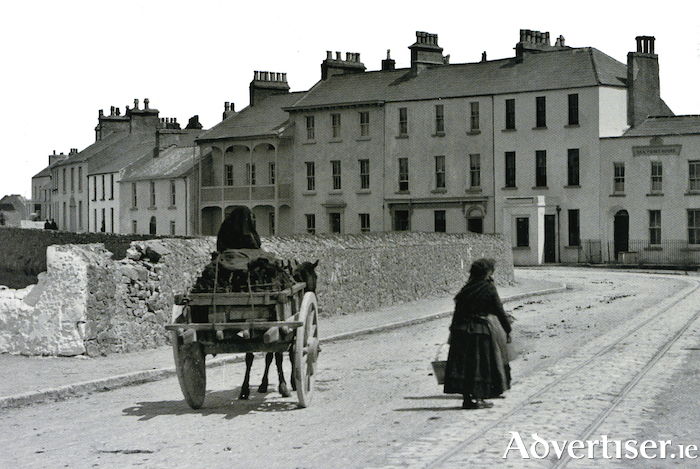 It is a narrative interspersed with countless asides, some of which have little or nothing to do with Galway itself, but which are informative of the realities of life at several levels of Galway society, particularity at the turn of the 19th and 20th centuries. The book gathers pace as the modern Salthill emerges with the building of the Eglinton Hotel; the improvement of transport between Dublin and Galway, and between Eyre Square and Salthill itself; the advent of the railway system and horse and tram service; the increase of small hotels; and the growth in attractions such as Tofts Amusements, all adding to the village’s reputation as an attractive tourist resort. With the buildings came the characters who built or developed them. Amongst these were two formidable women. Florence Toft of Toft’s Amusements became embroiled in a prolonged High Court battle as not all the residents in the vicinity of Salthill Park welcomed the hurdy gurdy of Toft’s Amusements during the summer months. While she eventually lost the case, she survived by moving the amusements indoors, and those doors are still open. Another formidable lady was Susan Emerson who became manager of the Eglinton Hotel in 1929. She won a Galway Corporation Seat in 1942 and subsequently played a major role in the development of Salthill as a thriving resort. A personal favourite is one Andrew King whose King’s Baths were at the bottom of the hill that rises towards Salthill, and who lent his name to Kingshill. King was a wheeler dealer and made several court appearances on charges, including permitting three pigs to wander at upper Dominick Street, for which he was fined the sum of one penny.